I just discovered ramen. Or maybe I should say that I just discovered GOOD ramen. I’d had it before, but was unimpressed: too salty, not very interesting… meh. But what a difference quality makes. My first taste was at Zutto (not one of the marquee ramen properties in NYC, but delicious none-the-less). I had their Tonkotsu (“pork bone”) ramen, which had a rich, but not cloying, broth. The richness of the broth (and the meaty chunks of pork) was well balanced with pickled ginger and scallions. Oh, and a nice amount of wood-ear mushrooms finished it off very nicely. I’ve been there twice (largely a function of its proximity to my usual stomping grounds) and enjoyed it both times. favorite, followed by Ivan and Ippudo. I also went to Dassara Brooklyn Ramen (Carroll Gardens, Brooklyn), but I had the Mushroom Ramen, which just did not work (despite my devotion for mushrooms). Where the other ramens have been characterized by delicate balancing of flavors, this was just heavy. I’ll wait to pass a judgment upon Dassara for when I’ve had a more representative dish. But back to the others. I really liked Ivan Ramen – funky, artsy decor and very friendly, helpful staff. They squeezed me in on Valentines Day! And the ramen was terrific. I had the Tokyo Shio Ramen, which used sea salt instead of soy – an interesting touch. The rye noodles seemed a little soft, but were tasty, and the pieces of pork were thick and juicy. I added enoki mushrooms (did I mention I’m a mushroom partisan? ), which normally I like. The texture wasn’t ideal in the context, and they didn’t quite work as well as the wood-ear mushrooms at Zutto. Oh, I had two sides: awesome deviled eggs (preserved duck egg as the pureed part!) and this Japanese sweet potato with miso, maple and pecans (a side, but I had it as desert). I’ve been to Ippudo twice. The first time was for a quick lunch at the East Village location, and I had their Shiromaru Chashu. The ramen was good – the broth was rich and velvety, and the noodles were springy – but the experience had a couple of strikes against it. First, the ambiance was a little louder than I was in the mood for. As guests are walked into the dining room, mostly communal tables (which I rather like), the person seating them calls out and the staff calls back. More importantly, the pork in the ramen was in thin slices and lacked any oomph; it almost felt like a garnish. My second experience, at their west-side location for dinner with friends, was better in just about every way. I had the Akamaru Modern, which is topped with their “secret ‘Umami Dama’,” which totally pulled the dish together, and seems to have juicier pork pieces (don’t know if this is the dish or the location). Oh, and then there was the appetizer, Tako & Eringi Karaage: “Tender, marinated octopus and king oyster mushrooms dipped in our signature ramen motodashi and flash fried. Served with macha salt and lemon.” Outstanding! (and, yes, mushrooms again…) My dining companions enjoyed the Sho-jin ramen, which is vegan and gluten-free (and thus reasonably kosher) and some very impressive-looking grilled lamb chops to start. Last, but not least, is chuko ramen. It’s in an unassuming space in Prospect Heights, almost at Atlantic Avenue, but it took my multiple tries to get in (without a lengthy wait). Even getting there early, I had to queue to gain entrance. But the staff was super-friendly and the food worth the effort. I started with some classic, yummy steamed pork buns – one of my favorites. The ramen was the epitome of balance: silky broth, springy noodles done perfectly, thick slices of juicy pork and a nice blend of scallions and wood-ear mushrooms providing contrast to more dominant components. It was simple and delicious. I can’t wait to go back! And the great thing is, there are a loads of other of ramen joints in NYC to try, many of which have their own particular takes on ramen in addition to the classic forms. Seriously, try ‘oogling “best ramen NYC” and see what comes back. EVERYONE has done a top-10 list: Zagat, seriouseats.com, thrillist.com (TWO lists… a 10 best and an 8 best under-the-radar ramen), the NY Times, the Village Voice and even am New York and vice.com. Sheesh. I’d love to hear other recommendations for ramen or thoughts on the places mentioned here. 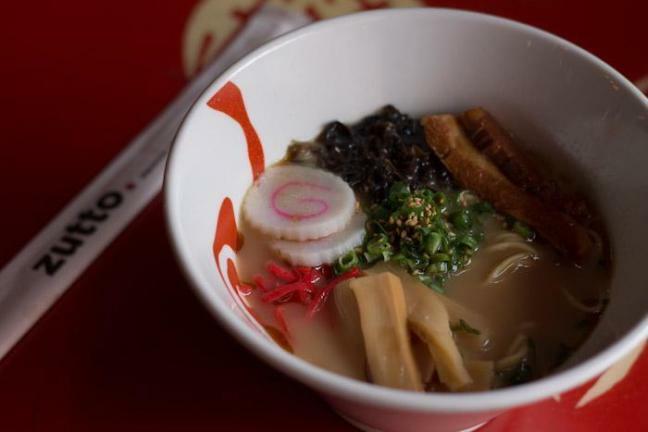 And for those not in NYC, is ramen going strong in your neck of the woods? Next up, a couple posts on weird fiction and desserts.